Up to 40 percent of total energy consumption in residential homes, manufacturing facilities, storage depots and commercial buildings is due to heating, cooling, air conditioning and lighting requirements. The issue of energy efficiency in buildings is being addressed in the Large-Area Fluidic Windows (LaWin) research project being conducted at the Friedrich Schiller University Jena, Germany. 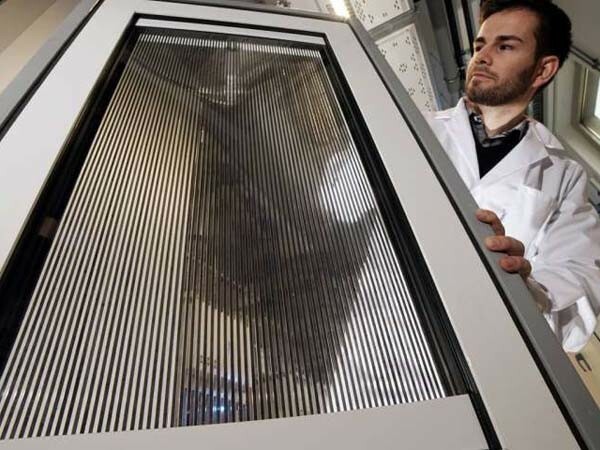 Project coordinator Lothar Wondraczek, who holds the chair of Glass Chemistry at the University of Jena, says that liquids are being used in windows and façades as heat carriers or to enable additional functions. New glass materials are being developed into which large-area channel structures are integrated and used for circulating functional fluids. In the prototypes from the research study, the liquid is loaded with nanoscale iron particles, which can be extracted from the liquid with the help of a magnet. The number of iron particles in the liquid will determine its colour in a grey to black spectrum. According to Wondraczek, the smart windows allow light to be automatically adjusted or solar heat to be harvested for use in the building. The efficiency in terms of heat gain per area is comparable with that of state-of-the-art solar thermal facilities, and the smart windows can be readily integrated in a vertical façade. The windows do not require a power connection. Large-scale fluidic windows can eliminate the need for air conditioning systems, daylight regulation systems and even warm water processing. Developing cost-effective large-size window glass modules is important; the glass elements need to not only include the channels, but also maintain their performance over the whole lifespan of the building. The system should also be able to integrate with standard window manufacturing technologies in double or triple glazing frames.